Intel Mobile Device | Teknision Inc. In order to strengthen its position as the innovator in mobile chipsets, Intel often has to demonstrate what kind of experiences their hardware is making possible. A glimpse of the near future. 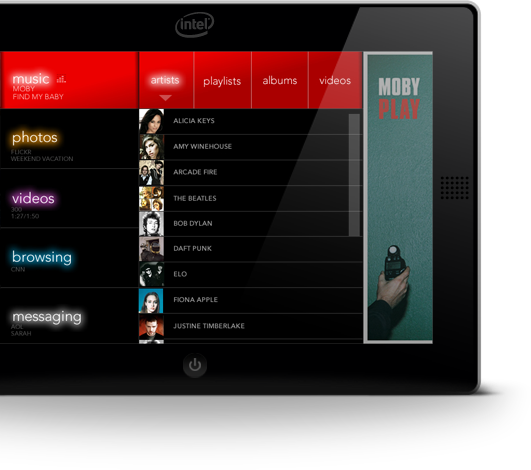 Intel commissioned Teknision to do a design study as to what a media consumption interface might look like on future mobile devices. The design parameters were based on prototype high speed, low powered mobile computers that could potentially fit between net tops and smart phones. This design study was based on a multi-touch interface and focused on the playing of music and video as well as instant messaging and web browsing.